When it became clear that the Nokia X was going to be the first Android-powered phone from the Finnish company that Microsoft now owns, it left many of us particularly excited. Android coupled with Nokia’s hardware chops promised to mean something rather special, but alas it wasn’t to be. The recently announced Nokia X may indeed have Android coursing through its veins, but it’s not quite as we’d hoped. 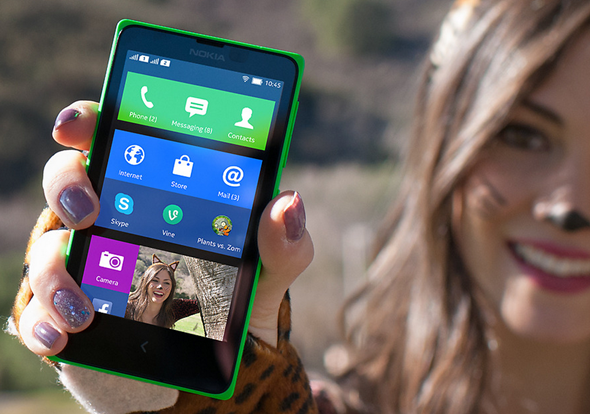 Heavily skinned and hampered by a low-end specification, the Nokia X shouldn’t be given too much of a hard time. After all, it’s aimed at emerging markets and costs less than a large skinny latte. But that doesn’t mean that we won’t wonder about what could have been. About what a Nokia phone powered by stock Android would be like. Of course, where there’s a will, there’s a way. The folks over at TechReporter clearly have the same feelings as we do about Android on Nokia hardware, which is why they’ve released a video showing a Nokia X running a third-party launcher that much more closely resembles stock Android than the effort put forward by Nokia themselves. Side-loaded like a boss, the new launcher replaces Nokia’s meddling and brings some of the standard Android experience to the Nokia X. Unfortunately it still doesn’t mean that the Play Store or even Google’s in-house apps are going to work on the cheap-and-cheerful handset, but the thought of being able to use third-party launchers like NOVA should at least fill many with a little hope. One day we wouldn’t be the slightest bit surprised to hear that Gmail, Google Maps and all the rest have been shoehorned onto Nokia’s hardware. This is Android after all, and Android enthusiasts love nothing more than making this work that shouldn’t. The Nokia X may not be the Android phone that we all wanted Nokia to give us, but with its amazingly low price tag and target of emerging markets, we can only hope that it’s a resounding success. Only then will Nokia perhaps give us what we all really want. If Microsoft lets it, of course. Now we just need someone to toss in CyanogenMod on the Nokia X. That would be epic!